Price: $299.95 & FREE Shipping. PRO model for professional and top class level in a new design, improved ergonomic construction and modern technology, high wearing comfort and safety, low weight, carbon sole. The model is offered with BOTAS ICEHAWK PRO skates with CR/VANADIUM STEEL blades. FLEX FENDERS TECHNOLOGY Special construction and technology facilitating greater dynamics of movement and optimum stance even in extreme situations. DOUBLE REINFORCE QUARTERS Double side reinforcement and stitching for effective absorption of lateral impact and firming of the sides of the boot. LAYERS THERMO TECHNOLOGY Modern technology reinforcing upper for firm support and the high degree of protection of foot – special manufacturing technology creates a tough and flexible upper resistant to impact and comfortable for the foot. TOTAL STABILITY TECHNOLOGY 2 Highly practical construction of tough plastic tip with increased room for toes guarantees maximum toe protection and high durability of the boot. AIR FLOW SYSTEM Heat and dampness extraction system created by apertures in the sole and in the replaceable insole. FLEX PROTECTION TONGUE New, slimmer, anatomically shaped tongue of lightened materials for the better fit and perfect, flexible support and protection of the foot. 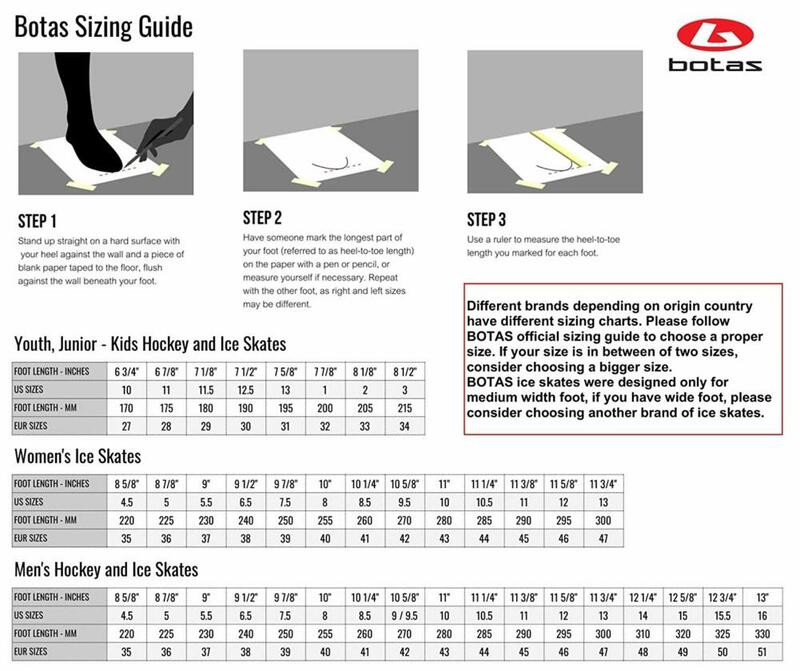 BOTAS ICEHAWK PRO Lightened construction with stainless blade HIGH-PERFORMANCE CR/VANADIUM STEEL – Low weight and excellent skating properties enable fast acceleration, excellent maneuverability, and stability. PAS-FIT Proven anatomic special construction and technology are creating a tough and flexible anatomically shaped heel and ankle part of upper with internal individually adapting soft padding, which ensures perfect grip and protection of foot.